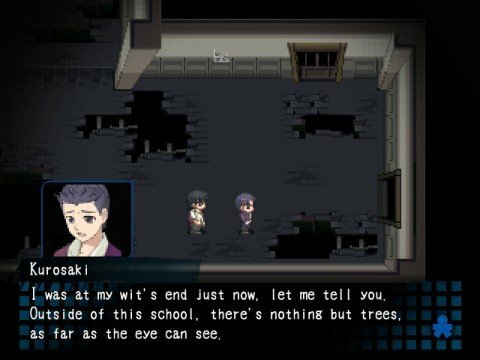 Corpse Party has the reputation of being one of the scariest games ever made. Shocking deaths filled with gore are the series’ calling card, and that’s what has made the recent outings so disappointing. 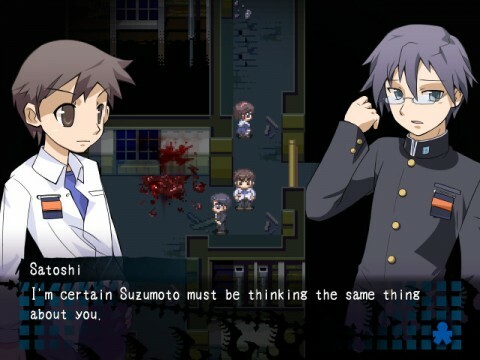 Last year’s Corpse Party: Blood Drive failed to be scary due to a reliance on a 3D art style that just didn’t work, and now XSEED Games have brought the original PC release to Steam. Right off the bat, Corpse Party is an odd series, as its success came considerably long after its original release. The 1996 PC version, which this is a remake of, didn’t have the impact that the 2011 PSP outing did. Instead, it was an RPG Maker produced horror game that faded into obscurity. There’s a reason why the PC original didn’t have the same impact as the PSP remake though, and that’s because it’s just not that scary. There were several reasons why Corpse Party was able to horrify players on PSP. The game featured great sound design (which is still present here, as they’ve added voice acting), and the death scenes were capped off with gruesome pictures that showed the carnage that had just happened. These cutscenes were an exclamation mark on important plot points, and helped make the writing stronger. You always knew there was a disgusting payoff coming after the description you were reading on-screen. That isn’t the case on the PC version, though. There’s no artwork that brings the most crucial story beats to life, and it has a very negative effect on the game. The writing just isn’t strong enough to bring chills to your spine on its own. It’s too busy wasting its time with childish humor, like when a character says she is going to “butter up my pooper,” to actually scare you. I honestly never appreciated how much of an impact the visuals had until I played this version of the game. On the bright side, the gameplay is largely unchanged here. 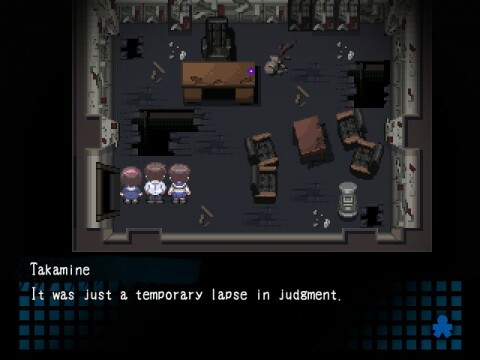 Corpse Party is a horror title built off RPG Maker, so don’t expect many mechanics. Basically, players can run away from enemies and pick up items. That’s about it. There isn’t any amazing puzzle solving to be found, just a lot of running around a school hoping you picked up everything you need to not reach a premature ending. Corpse Party is broken up into 5 separate chapters and you can get several different endings in each of them. Completionists will probably want to discover all of the bad endings as well, which end with an early demise for characters. If you just want to progress through the game’s story though, you can definitely do so, but you’ll probably want to use a walkthrough, as the trial and error nature can be extremely frustrating at times. If there’s one thing that has remained a positive for Corpse Party, it’s that the overall story is still a compelling one. Sure, it might struggle in areas and shift its tone too much during small scenes, but the major arcs are still well written. It’s also nice to remember a time when the story wasn’t as convoluted as Blood Drive made it. While Corpse Party is largely a faithful recreation of the original PC game, there are some nice bonuses here that returning players will enjoy. There are 4 additional chapters in the PC release, and one is a retelling of a shocking scene in its sequel, Book of Shadows, which is a definite highlight of the package. There’s also new artwork that shows up during some dialogue sequences. However, it’s pretty awful. The main issue is that most of the characters have eyes that are about half as big as their face. It’s distracting, and it just doesn’t look good. Throw in the fact that this remake has some technical issues (the game will often pause for a brief moment to change the lighting), and you have what is ultimately a disappointing package. Sadly, the recent PC release of Corpse Party just isn’t the best way to play the original game, as the PSP remake is far better. This version lacks the artwork that brought the gruesome scenes to life, which is a problem since the writing itself just isn’t strong enough to scare players. Longtime fans of the series will enjoy the extra chapters, though, and those are the only people that I can really recommend this game to. If you’re looking to experience the series for the first time, you’re better off waiting for the 3DS release that hits later this year.